Setting a vendor (supplier) on a product is needed in order to create purchase orders using the low inventory report. Use the product edit screen "Suppliers" tab to assign suppliers for a product. Select multiple suppliers by holding the Ctrl or Cmd key. 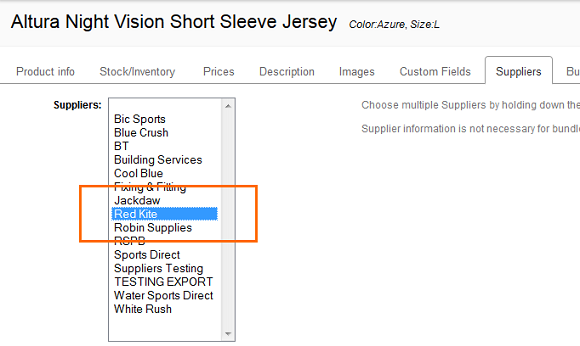 You can also use the product list to batch assign suppliers to products. Select your items and from the batch actions choose to "set supplier". You can assign suppliers to products using a spreadsheet too. Read more about updating products using a spreadsheet here. Identify all vendors (suppliers) which have been assigned this price list. Identify all products which have a non-zero price on this list. Assign the supplier to the products. Learn why you might want to assign suppliers / vendors to products, and how to do so, using the product edit screen, the product list, or by importing a spreadsheet in Brightpearl.